If anyway you are dissattisfied please call 877-GT-GRASS and we will be happy to work something out with you. Our main goal is to share wheatgrass with the world, so if you have any suggestions or comments please call. Free Delivery on orders of $100 or more within 25 miles of Houston. Everything included-- the wheatgrass shots packaged in 30 shot packages with insulated packaging, techni ice packs with dry ice then shipped from Fed Ex facility located in Houston, Texas on Mondays and/or Tuesdays. 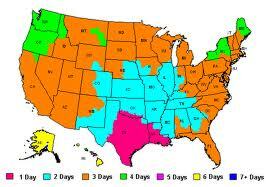 Once shipped you will receive a tracking number, to follow your grass across the country. We love our grass and take the best care we can. To insure the wheatgrass will not thaw in transit by being housed in a FedEx facility through the weekend we find shipping early in the week prevents this. Most orders will arrive Wednesday, or Thursday. hand delivery may also be done by GrassOntheGo throughout the week for Houston, Texas and surrounding area. If you have any questions about your order please call us or email.